For the love of all things otaku—anime, video games, figures, you name it!— power-pedaling Sakamichi Onoda has long been conquering the steepest slopes and regularly making the ninetykilometer round-trip to Akihabara on a granny bike!! 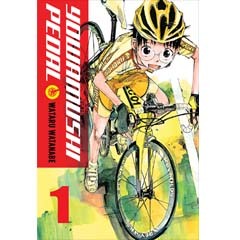 But when his bike commute to his new high school lands him in a confrontation with the serious first-year road racer Imaizumi, Onoda has a major showdown on his hands! Can this meek geek really out-pedal the future ace of the school road-racing team? !